A cute last day of school gift idea as seen on Pinterest! In this free download you will find gift tags that you can use. I downloaded this as a Word document so that you can make the changes that work best for you! Also, I tell you were I got my other materials as well as pricing. 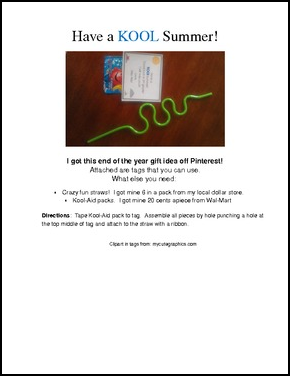 Your students will love this inexpensive end of the year gift! Please Note- Since I downloaded this as a Word document, the thumbnails look off. Please download to see the document better. Also, please leave positive feedback if you like this free download. It really means a lot if you do :). Thanks!